The Campbell Brothers are playing in Califon, New Jersey, this Saturday as part of a blues festival to benefit the Lebanon Township Education Foundation. 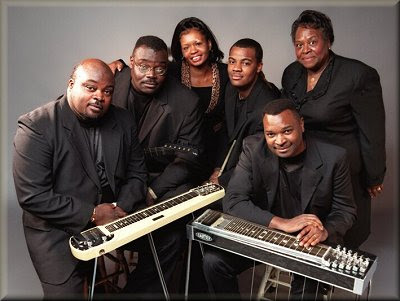 The Bourbon Street Blues Fest starts at 11:30 AM, and the Campbell Brothers are scheduled as the second act at 12:10 PM. This all-day event with lots of bands only costs $25 for adults, $5 for school-aged kids, and it's all for a good cause. For more info, visit www.BourbonStreetBluesFest.com. The Campbell Brothers web site address is www.campbellbrothers.com. Love the Campbells, saw them at Wheatland a few years ago, super high energy band. Chuck is a steel guitar fanatic. If you want to hear lap steel and pedal steel in one band, this is the one to see/hear. Yeah, they're my favorite band. Seriously? Your favorite band? Wow! I'll have to take a listen. Not a flip comment at all. They are just great to watch in person, and I often listen to their CDs in the car. They are great musicians with a very uplifting sound.